From left to right: Professor Seymour Jones, Mark Lilling, Barry Fingerhut, and Joel Levy. In November, nearly 200 academics, industry practitioners, regulators, and legal professionals attended a gathering at NYU Stern to debate whether it is practical or necessary for nonprofit organizations to implement Sarbanes-Oxley governance reforms. The event, sponsored by NYU Stern Ross Institute’s Corporate Governance of Not-for-Profits, was moderated by Seymour Jones, clinical professor of accounting at NYU Stern, and Mark Lilling (BS ’72), managing director at Great Neck, New York-based Audit Committee Consulting Team LLC. Lilling noted that in New York City alone there are 92,000 nonprofit organizations with a total of $218 billion in assets. Given the vast number of organizations – and the vast size of their assets – he asked panelists whether nonprofit organizations should be subject to a set of regulations similar to those imposed on corporations by the 2002 Sarbanes-Oxley Act. Barry Fingerhut (MBA ’69), president of GeoCapital, LLC, who sits on a number of private boards, including the NYU Stern Board of Overseers, spoke about his experience as a board member at FEGS, the largest not-for-profit health-related and human services organization in the United States. According to Fingerhut, FEGS is already years ahead of public and private boards in terms of accounting practices and has always had adequate controls in place. However, he noted that a majority of nonprofits are under-funded and under-managed, and would have a difficult time being compliant with Sarbanes-Oxley. Gerald Rosenberg, chief of the New York State Attorney General’s Charities Bureau, discussed how his agency investigates accounting abuses by nonprofits using anonymous tips from insiders and by reading the charities section of The New York Times. Teresa John, professor of accounting at NYU Stern, concluded that certain provisions of Sarbanes-Oxley, such as those dealing with independent boards, audit committees, audits, and improved controls, would indeed benefit the not-for-profit world. Michael Hayes, a partner at PricewaterhouseCoopers LLP, said he believes that a majority of nonprofits are already implementing a good number of Sarbanes-Oxley regulations, but on their own timetable. Other panelists included: Joel M. Levy, CEO, YAI/National Institute for People with Disabilities, and James S. Sligar, a partner at Milbank, Tweed, Hadley & McCloy, LLP. The Corporate Governance of Not-for-Profit Organizations forum was made possible through the generous support of NYU Stern alumnus Mark S. Lilling and The Audit Committee Consulting Team LLC. In September, Amy Chua, professor at Yale Law School, delivered the annual Lubin Lecture to a packed audience of NYU Stern students and alumni from the Undergraduate College's Scholars Program. During her lecture, Chua recapped the key themes from her book, World on Fire: How Exporting Free Market Democracy Breeds Ethnic Hatred and Promotes Global Instability, which The Economist selected as a “Best Book of 2003.” Chua captivated the audience with her perspective on the impact of globalization, and discussed at length her theories on “market-dominant minorities,” citing examples ranging from Burma to The Republic of the Ivory Coast. 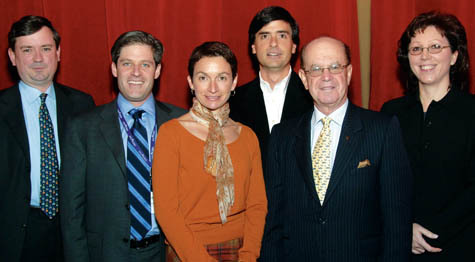 The Lubin Lecture was established by Joseph I. Lubin, a distinguished business, civic, and philanthropic leader and Trustee of New York University. 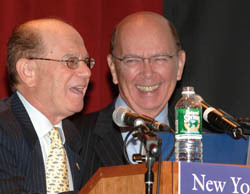 The lectures have attracted world-class leaders to NYU Stern including such prominent figures as Vice President Hubert Humphrey, former US Senator Jacob J. Javits, and former Federal Reserve Chairman Paul A. Volcker. In April, Thomas Friedman, foreign affairs columnist at The New York Times, journalist, and author of The World is Flat, will deliver the 2006 Lubin Lecture. 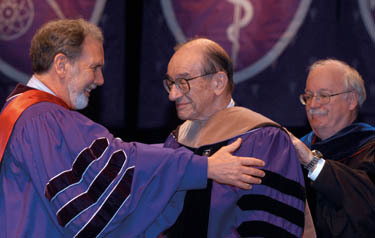 At a special convocation in December, New York University conferred honorary degrees upon two highly distinguished figures in the field of global finance: Alan Greenspan, chairman of the Board of Governors of the Federal Reserve System, and Gordon Brown, chancellor of the Exchequer of the United Kingdom. In accepting his honorary degree, Greenspan commented on how, on average, world standards of living are rising in large part because of the widening embrace of competitive free markets in China and India. “Since the autumn of 2001, global gross domestic product per capita has grown more than 8 percent. And growth in developing Asia, where so many of the world’s poor reside, has been considerably faster,” said Greenspan, whose 18-year tenure at the helm of the nation’s central bank ended in January. Brown, who has served in the UK’s top financial post since 1997, lauded both NYU and New York City in his acceptance speech. “It is a privilege to be awarded and to receive an honorary degree in this great city, from this great university, which by virtue of its location – in and of the city – has become a global university of and for the world,” he said. Martha Stewart (left) and Susan Lyne. Steve Florio, (BS ’72), an executive-in-residence at NYU Stern, takes the title of his course literally. For his course, Leadership in the Communications Industry, the former president and CEO of Condé Nast Publications, Inc., routinely exposes his students to well-known leaders in the communications industry. Last September, Viacom Co-president and Co-chief Operating Officer Tom Freston (MBA ’69) visited NYU Stern and spoke candidly with MBA students and alumni about his rise from one of the founders of MTV to the chief of a leading global media company, which now includes CBS, Nickelodeon, Comedy Central, Spike TV, and Showtime. In January, Freston became the chief executive officer of Viacom. Freston said it was important for Viacom to focus on its consumers, meet their needs, and deliver on their expectations, particularly in a “media world that is in an unbelievable state of disarray right now – it’s becoming fragmented because of the Internet.” He cited creativity, innovation, and open-mindedness as key factors in the company’s success, and noted the company’s commitment to having a global perspective, decentralized management, and strong employee culture. On November 2, Florio brought in Martha Stewart, founder, and Susan Lyne, president and CEO, of Martha Stewart Living Omnimedia, Inc., to speak candidly with students about the rise, fall, and recovery of the lifestyle corporation. After years as a stock broker, Stewart pursued her dream of creating beautiful “How To” books on homemaking. She found a partner in Time Warner after meeting much resistance from countless publishers, and proved that tireless persistence in pursuit of one’s goals does indeed pay off. Stewart also spoke openly of the scandal involving her sale of shares in the drug company Imclone, which temporarily derailed her career and created a series of challenges for Martha Stewart Living Omnimedia. Susan Lyne followed Stewart, detailing her career path, including her term at ABC working to launch hit television shows “Desperate Housewives” and “Lost.” Lyne, who joined Martha Stewart Living Omnimedia in 2004 during a critical transition for the corporation, described the initiatives she has put into motion at the company to rebuild momentum, strengthen the management team, and return the Martha Stewart image to television. Martha Stewart’s new shows “The Apprentice” and “Martha” debuted this fall on NBC. 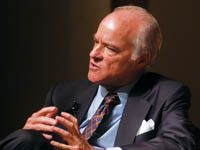 NYU Stern's Berkley Center for Entrepreneurial Studies, with the help of Stern alumnus Al Berrios (BS '00), recently welcomed Henry Kravis, co-founder of Kohlberg Kravis Roberts & Co., the private equity firm that was instrumental in legitimizing the use of leveraged buy-outs for underperforming organizations. Jeffrey Robinson, Stern assistant professor of management, conducted a candid interview with Kravis in front of an audience of 150 students and alumni. Kravis described his early professional years as a runner at Goldman Sachs, which marked the start of a successful career on Wall Street. He also spoke about the launch of Kohlberg Kravis Roberts & Co. (KKR) and two of its most well-known acquisitions, RJR Nabisco and Toys “R” Us. He then touched on KKR's newest endeavor – the company's expansion into the Asian market with the opening of offices in Hong Kong and Japan. 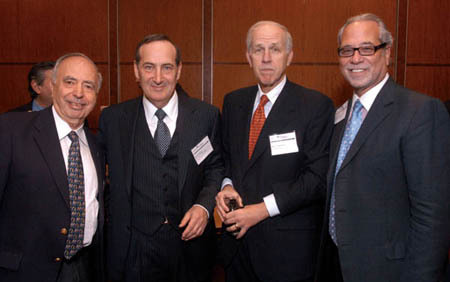 From left to right: Al Berrios, Henry Kravis, Deputy Dean Russell Winer, and Professor Jeffrey Robinson. From left to right: Dean Thomas Cooley, Myron Scholes, and Luc de Clapiers. The rapid growth of hedge funds has been one of the biggest stories in the financial world in recent years. Last September, a conference convened by NYU Stern’s Salomon Center brought together two Nobel laureates, several hedge fund pioneers, and about 400 people from the frequently overlapping spheres of finance and academics to discuss trends and research in the field. The Hedge Fund Conference, sponsored by IXIS Capital Markets, a member of the fourth largest banking network in France, opened with remarks from NYU Stern Dean Thomas Cooley and IXIS President and CEO Luc de Clapiers. Michael Steinhardt, the former managing member of Steinhardt Management LLC and a legendary figure in the hedge fund industry, gave the morning keynote address. Steinhardt reflected on his 27-year career in hedge funds and discussed the changes that have affected the industry since his retirement. Steinhardt pointed to what he views as the alarming proliferation of hedge funds today, the increased management fees which are not reflected in returns, and the heightened emphasis on transparency between manager and client. Steinhardt advised fund managers to make sure their first priority is always to make money for their clients. Professor Robert Engle spoke about his new research on measuring downside risk. The conference featured professors from leading business schools who presented new research on hedge fund-related topics, including market price of variance risk; share restriction and asset pricing; hedge fund performance, risk and capital formation; and measuring volatility. Robert Engle, 2003 Nobel Laureate and Michael Armellino Professor of Finance at NYU Stern, shared his new research on measuring downside risk. In several panel discussions, financial services executives covered a wide range of issues, including performance expectations, evaluating hedge funds, and risk strategies/management. In his luncheon keynote address, Myron Scholes, 1997 Nobel Laureate and chairman of Oak Hill Platinum Partners, addressed the prevalence and inevitability of systematic risk in hedge funds. These risks include major events, such as Hurricane Katrina and September 11, which always impact the economy and ultimately clients’ investments but cannot be predicted. Scholes suggested that managers build flexibility into their risk models to account for unanticipated events. The conference concluded with a dinner reception featuring Alan Blinder, economics professor, co-director of Princeton’s Center for Economic Policy, vice chairman of The G7 Group, and a former vice chairman of the Federal Reserve Board of Governors. Blinder spoke of the impending regulations the SEC is expected to impose on the hedge fund industry. He outlined the different types of regulations, from disclosure to anti-fraud guidelines, and recognized that while some of the generic arguments for regulation apply to hedge funds, self-regulation should be sufficient to ensure good business practices. and Jeanne Marano, executive director of Alumni Affairs. Edward Altman, Max L. Heine Professor of Finance at NYU Stern and the vice-director of the Salomon Center for Research in Financial Institutions and Markets, recently led a Lifelong Learning Workshop on “Investing in and Analyzing Distressed Debt.” This half-day workshop, sponsored by the Office of Alumni Affairs, featured a presentation by Altman and Wilbur L. Ross, Jr., the noted turnaround financier and chairman and CEO of WL Ross & Co. LLC, as well as a luncheon and a panel discussion with industry experts. Ed Altman and Wilbur Ross. Altman offered a preview of his famed “High-Yield Bond Default and Return Report” for the third quarter of 2005. Altman explained that while default rates have retreated from their high in 2002 and investors have seen an all-time high recovery rate of 60 percent in the third quarter of 2005, there will be higher default rates in the future, with larger companies among the victims. “No longer is size a proxy for health,” said Altman, who was named one of the 100 most influential people in finance by Treasury and Risk Management magazine. He noted that the market has grown dramatically in recent years, with a face value of $700 billion, market value of $540 billion, and an estimated $150 billion dedicated to investing in this area in America alone. The workshop concluded with a panel discussion with industry experts Allan Brown (MBA ’94) from Concordia Advisors, Geoffrey Gold (MBA ’91) of Strategic Value Partners, Max Holmes from Plainfield Asset Management, and Marti Murray (MBA ’86) of Murray Capital Management. Altman has been educating Stern MBA students on “vulture investing” and “bankruptcy predication” for 30 years and has approximately 50 graduates known as “Altman’s Vultures,” who are established professionals in the distressed debt markets. Mutual fund pioneer John Bogle kicked off NYU Stern's 2005-2006 Author Lecture Series with a rhetorical jolt. The founder and former head of The Vanguard Group of mutual funds, Bogle has been an advocate for the individual investor for more than 50 years. Since retiring from Vanguard in 2000, he has emerged as a frequently caustic critic of corporate governance. His most recent book, The Battle for the Soul of Capitalism, lays out his views on the recent failures of the American financial system. In a discussion on November 17 with a packed house of alumni and students, Bogle noted that his lectures at NYU Stern – he was a visiting professor in the 2000-2001 academic year – served as a precursor to his fifth book, The Battle for the Soul of Capitalism. 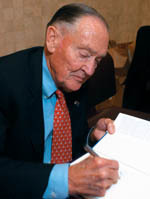 The book examines how, in Bogle's view, the business and ethical standards of investment, corporate, and mutual fund America have been greatly compromised as the US economy has moved from an ownership society in which individuals held the capital of corporation, to a structure in which institutions predominate as owners. As a result, he said, owners' capital has been put at risk to build the interests of corporate and financial managers. Bogle suggested that we need to return to building companies with integrity, and to a system in which the money invested in a company and put at risk by the investor is actually used to benefit the investor rather than corporate and financial managers. 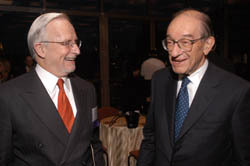 Bogle, 75, offered extensive anecdotes from the corporate, investment, and mutual fund arenas. Among his observations: there has been a failure of corporate gatekeepers and a rise in management compensation; the proportion of stocks held by individuals has fallen from 92 percent in 1950 to 32 percent today; and the mutual fund industry has been taken over by financial conglomerates, with 41 of 50 fund managers being publicly held. “It is time to build the world anew,” Bogle argued. “Fund managers today are in the business of earning a return on their capital, not yours.” He called for the formation of a federal commission that would develop policies to respond to corporate failures. He also recommended taking the steps necessary to eliminate the shortfall of public, private, and individual retirement plans, and reaffirmed his desire to create a fiduciary society where citizen investors receive their fair share. 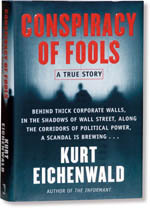 In October, New York Times reporter Kurt Eichenwald, who chronicled the demise of Enron in his best-selling book Conspiracy of Fools, delivered the first Haitkin Lecture. Hosted by NYU Stern's Market, Ethics and Law Program, the Haitkin Lecture aims to analyze issues of ethics and integrity in the practice of business. It is made possible through the generosity of alumnus Jeffrey Haitkin (BS ’68). Eichenwald, a two-time winner of the George Polk Award for Excellence in Journalism, outlined the business judgments that brought about Enron’s epic failure and the moral lessons of those actions. “The vast majority of what people believe happened, didn’t,” said Eichenwald, who estimated that incompetence and bad management were two to three times more prevalent than illegal activity. Eichenwald chronicled Enron’s transition from a simple oil pipeline company to an energy trading company, and cited the positive publicity that management received in the press as a defining moment in the company’s development. Enron’s senior managers, he said, believed themselves to be so smart that they effectively abandoned the work. Their collective arrogance was a fundamental element in the company’s collapse. Having read all of Enron’s board minutes and documents since 1992, Eichenwald spoke authoritatively about the many foolish decisions made at the company. Enron, he noted, invested $12 billion in an assortment of ill-advised ventures, including a liquid natural gas plant in India, retail distribution in Brazil, and an Internet broadband business. All these investments were badly planned, badly executed, and underpinned by poor analysis, which compounded the problems brought about by a series of complicated, conflict-ridden deals constructed by Chief Financial Officer Andrew Fastow. “The question is ‘How did Enron stay afloat so long?’ not ‘How did it collapse so quickly?’” Eichenwald said. After all, neither the company’s business model, structure, or managerial mindset actually worked. Enron had “a poisoned culture of arrogance” that silenced those employees who questioned management.